MacDailyNews Take: Strike that. Reverse it. It will never be a workstation without a mouse interface. What Danny said. Plus file system, large screen, real multiprocessing, etc. Apple is chasing the Surface with this, not the workstation crowd. I am laughing too, so probably best not to speak for everyone else based on your own presumptions and prejudices, it just looks childish. Have you actually seen the relevant sales figures? But at least it can extend the screen onto multiple monitors. ..yep, definitely not a workstation. … And you think that makes your surface a workstation. Some people seem to have a very narrow view of what a workstation is but in your case you have imagination the size of a planet it seems. In my opinion neither are seriously work stations but at least the iPad has the potential to be should Apple decide to actually exploit its power. Meanwhile the surface barely has the power to run a toaster. The previous version of this keyboard is a disaster. Look at the reviews! “This assessory does not work with this device!” 90 % of purchasers hate it! Is that a Kickstand? Wow and the pencil is held on by a magnet. Just like the Surface devices that have been out for how long now?? Oh and they are computers, not toys. I never realised that when Apple dropped Computer from their name that it meant they were dropping computers from their lineup. Just buy a MBP then? Yes, I agree that the surface pen is magnetized… although it doesn’t charge. And although the iPad Pro is arguably LESS capable than a Mac, iOS is REALLY opening up. 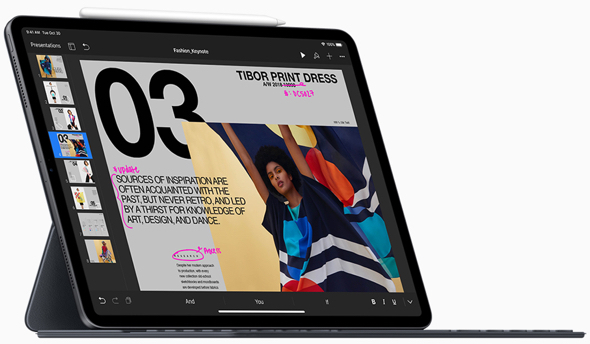 If it fits your workflow, this iPad pro can replace a Macbook for many, many people… or at the very least be a portable accessory for your far less portable desktop iMac Pro or Mac mini. It’s not a kickstand actually you know… and wow anyone would think the surface was actually a success by your bloated and rather surreal take on the matter. You can’t beat the smell of fear from the deluded in the morning. That’s two laughs I have had on here so far already, for keep it up boys. Apple’s keyboard prices are as out to lunch as there SSD and RAM upgrade prices. It’s a keyboard it’s worth maybe $40 or $50 because it’s from Apple but $200 is a total rip off. On that one has to agree. Yet no backlit keys…again. Maybe Apple doesn’t realize there’s such a thing as night. Same oversight mentality: adding another 70 emojis in 12.1 without any search function to help quickly find one. Apple creates great products, yet at same time manages to overlook the obvious. Quite a conundrum. late 2018 and still no OLED?